This work is dedicated in the memory of Susan Fulton, who’s heartwarming and supportive reviews helped fuel the muse. The banging on his bedroom door slowly brought him to full awareness. With his fingers still clutched around a bottle of cheap rye, his eyes partially glued shut and crusty, he was not ready to face the day. And from the amount of sunlight sneaking through the curtains he’d bet it was not yet eight in the morning. Turning onto his back he shook the empty bottle free from his still sleeping fingers and squashed a pillow over his face hoping and praying whoever was on the other side of the door would give up and go away. Alas it was not in the cards. “Standish, get your lazy, good for nothing hide out of that bed. You are due outside, down at the stage office in twenty minutes!” The unmistakable growl that could only belong to their resident gunslinger shot through the wood door. His statement was punctuated by several more well placed blows to the innocent door. The man had no tact. It was not in good form to drag decent people from their comfortable beds before ten in the morning, especially not by banging on their bedroom doors and screaming at levels only fit for the out of doors. Ezra lay there pretending not to be in the room, hoping maybe Chris would think he’d missed Ezra, and he’d leave to check. He waited in the sudden silence. Maybe it had worked, he thought to himself. Mere seconds later his bedroom door was viciously kicked in from the other side, part of the door’s locking mechanism sliding across the wood floor to bounce off the far wall. He shot up in the bed as the Angel of Death descended, and here he was sitting helplessly tangled in his nightshirt and bedclothes. Attempting to make a valiant effort to exit the bed with a modicum of decorum, Ezra landed in a heap on the floor with the down filled duvet. Chris stood at the end of the bed with a scowl on his face and his hands on his hips watching as the gambler untangled himself from linens and sheets. “Mr. Larabee, I must protest the manner in which you tried to roust me from my slumber.” Ezra pouted as he gathered up the rumpled bedclothes and threw them into the center of his luxurious four poster bed. Going over to the wardrobe, Chris reached in and pulled out Ezra’s clothing, which he tossed at the gambler. “Ez, we have a stage to catch and then a train.” Ezra glared at Chris as the gunslinger dug through his chest of drawers pulling out his underclothes which he tossed onto the bed. “If you make the stage late with your dilly-dallying we may miss the train and then I’ll--,” Chris recited as he dug out the gambler’s carpetbag from the bottom of the wardrobe and threw that onto the bed. “If that is supposed to placate me it isn’t working.” Ezra flopped dejectedly onto the bed and rubbed his aching temples. They hadn’t even gotten on the stage yet and he was already dreading the journey. Cocking an eyebrow at the gambler Chris stood at the foot of the bed and waited. Ezra shot the gunslinger a scandalized look. “I will not perform my morning ablutions while you remain in this room.” He could be just as stubborn as Four Corner’s stalwart gunslinger, he thought to himself. Ezra just hoped he possessed the same fortitude as Mr. Larabee. Chris waited and waited some more but Ezra did not budge. Perhaps he should back off so they could at least make the stage. Chris realized he was going to have to pick his battles carefully since it appeared the gambler was just as stubborn as he was. At this rate they’d never get out of the saloon. Chris decided to concede this battle. “Fine, do what you want. The stage leaves thirty minutes with or without you.” Chris left the room without further comment. “He’ll be here. Just be ready to go when he shows up,” Chris called up at the driver and glanced up the street in the direction of the saloon. Ezra was nowhere to be seen. Chris started pacing back and forth waiting for the gambler to make an appearance. He had specifically told Ezra the stage was leaving in thirty minutes. How long did it take to get dressed? Next time he’d just drag him down here in his nightshirt, kicking and screaming all the way. Chris smiled, an evil glint in his eye at the thought. It’d be no one’s fault but Ezra’s. “I’m not going to get all twisted up.” Chris huffed and rubbed at the back of his neck. Little dust devils blew up when a light breeze meandered around the thoroughfare out in front of the stage office. The breeze did little to dispel the heat radiating up from the hard-packed street and Chris impatiently wiped at the sweat beading up on his face. He wasn’t looking forward to the claustrophobic confines of the stage; the driver had informed him they would be traveling with an almost full compliment of passengers heading on to Ridge City. Just his luck, he thought, not only did he have to pass the time with a gambler who was reluctant to travel, he’d have to put up with no leg room and being squashed amongst the other passengers. This day was just getting better and better. “Hush yourself, man,” the irritated driver called down. “Or I’ll be forced to hit every bump and rut on the trip.” Indistinguishable grumblings drifted from the interior of the stage and fell on deaf ears. “Never fear, my grim faced Mr. Larabee. When was the last time you knew a train to leave precisely on time?” Ezra brushed at some lint or other piece of fluff on the sleeve of his hunter green coat. “Everything will be fine, don’t worry. Good luck you two. See ya, Ez,” Vin called as the stage driver clucked the horses into motion. Vin stepped further out to watch the stage head out of town. Ezra leaned out the window and waved. Vin waved back as it got smaller in the distance. “Better enjoy it while it lasts,” Vin sniggered as they walked through the saloon doors and out of the hot morning sun. Ezra looked around the confines of the stagecoach, observing his fellow passengers. Across from him sat a rather large woman who seemed content on taking her half out of the middle of the seat. She had dark curls shoved up under an impossibly wide bonnet covered in pink ostrich feathers. Her son, who was squashed between Chris and her, seemed to be suffering from some strange digestive malady that caused him to belch and break wind insistently. The gambler sat next to a traveling salesman who used too much pomade, constantly blew his nose, and wore a moth-eaten Houndstooth coat that had probably never been cleaned. Their final passenger was a stick of a woman with the most severe features Ezra had ever laid eyes on. He was almost positive if she even attempted to smile her face would crack. She had dressed all in gray and it looked as if all the life had been sucked out of her small figure. Chris was slumped in the corner with his hat pulled down over his face trying to avoid contact with the other passengers. Ezra shook his head in amusement as he pulled his hat low and tried to catch a short cat nap, his hangover pounding roughly behind his eyes. Chris watched as Ezra succumbed to the rocking of the coach and wished he could fall asleep that easily but he didn’t feel he could let his guard down yet. He was unfamiliar with this driver and his associate so he wasn’t sure how capable they were. He wished they could have traveled by horseback but it would have been impractical to leave Pony and Chaucer in Ridge City until their return. The gunslinger could see smoke on the horizon. Apparently, the next way station on their journey so at least he’d be able to stretch his legs for a few moments before continuing on with a fresh set of horses. He hated traveling by stage; it was the most uncomfortable mode of travel, especially when they tried to fit as many people into it as possible. Sometime over the past two hours the youngster sitting next to him had fallen asleep and had come to rest against his side. Chris had finally given up pushing him over to his mother after the fifth time. It was too hot in the stage to have a warm body pressed up close to his, he felt as if he would melt into a puddle on the floor. Ezra woke as he felt the coach slowing and peered out the window, the way station coming into view. “How much further to Ridge City?” he asked on a jaw cracking yawn. “How about you go take a look at the stage routes posted on the wall over there and tell me.” Chris clapped Ezra on the shoulder before heading around behind the building where the privies were located. As Chris came around the front of the way station, Ezra was heading around back with a medium sized satchel in his hands, “Mr. Larabee, if you would be so kind to hold this for me I be will more than willing to share. I need to take care of a pressing matter.” He handed it off to Chris without a glance back. Chris set the bag down on a nearby barrel and perused the contents. He had to admit there was a benefit to traveling with Ezra; the man liked his creature comforts. Somehow the gambler had appropriated a small bottle of Kentucky Bourbon, a bottle of Rye, two apples, six fluffy biscuits, cheese, and what appeared to be a small jar of strawberry preserves. Would wonders never cease? This trip may not be so bad after all. “Shake a tail feather folks! Daylights burnin’, got a schedule to keep!” The driver yelled from where he was checking the team of horses over. As the men waited for the women, Chris could hear feminine chatter nearing the stagecoach, actually wishing that they would hurry up so that they could complete the next leg of their journey. Grinning widely, Rupert climbed up into the coach and plopped down next to his mother. “Back into the box,” Chris groaned as he pulled his lanky body up into the coach behind the skinny woman and slouched into his corner, placing the bag behind his feet. “Twice you say? Why would you continue to travel this line if you have been robbed that many times?” Ezra inquired as he looked out the window for anything out of the ordinary. “Oh this and that, whatever I can get my hands on that might be interesting to folk who can’t always get to town. Right now I’ve got ladies undergarments made of the softest silk. Lavender soap, various spirits, elixirs, etc.,” he explained as he tried to get comfortable once again. A finger tapping him in the arm had Chris looking down and he realized the child had some type of sticky substance all over his face and hands. Chris contemplated two seconds suggesting Rupert not touch him with his messy hands but thought by mentioning it, it would happen all that much sooner. Chris gingerly took the offering from the child smiling softly as he placed it in his pocket. “I’ll save this for later. And no, I’ve never met a real live pirate but you may want to ask Mr. Standish here because he used to ride the riverboats on the Mississippi.” Chris sent a leer at the gambler as he turned the child’s focus onto his traveling companion. “Don’t see how much has changed.” Chris smirked as he straightened his legs out before him. The stage took off like a shot throwing its occupants around in the interior. As the stage tilted precariously to one side Ezra watched as Rupert and his mother slid into Chris, pinning him to the side of the stage. Ezra grimaced as Chris grunted in pain and Rupert squealed from being squashed between the two adults. As the stage righted itself Ezra reached across to help the woman right herself. “Oh! Unhand me, sir! I do not need your assistance!” The large woman cried as she slapped at the gambler. Ezra glanced at Ms. Wolcott and tipped his hat in greeting. She kept her eyes downcast but nodded in acknowledgment. As Ezra studied her he realized that if she actually wore something with a touch of color and did not sport such a severe hairstyle that it would soften her features. Chris watched the passing terrain, hoping the fifteen miles would pass quickly. As the stage crested the hill, Ridge City spread out below them, its buildings bathed in the reds and ambers of the encroaching sunset. In the distance the train approached the town and the driver whipped the horses into a frenzied clip, wanting to beat the train to the depot. In the stage, the passengers were thrown around willy-nilly as they were caught unaware and were thrown to the floor when the stage hit a particularly bad bump. Mr. Mathers’s solar plexus made an uncomfortable acquaintance with Chris’s knee. Chris grunted in pain as his outstretched hand came into hard contact with Chris’s inner thigh as the salesman tried to halt his descent to the floor. “Sorry,” he gasped out as he quickly pushed away and levered himself back into his seat. Ms. Wolcott pulled herself back into her seat with as much decorum as she could while bearing up under Mrs. Brooks scathing glare. “Ridge City!” the stage driver yelled as they entered on the outskirts of town, the stage slowing to a more sedate pace as they neared the train depot. As the stage came to a stop the driver hopped down and pulled the door open, coming face to face with his scowling passengers. “Train will be here in a few minutes, better shake a leg.” He laughed and spat a wad of tobacco out on the dirt. Mrs. Brooks gasped and put a hand to her breast before turning her head away in disgust. Mr. Mathers hastily climbed out and proceeded to assist the ladies out of the stage. Rupert jumped out of the stage with an ear splitting screech, laughing as he landed in the dirt. Chris and Ezra were the last to exit, and Ezra thought if looks could kill, their stage driver would have been dead ten times over at the glare Chris gave the man. Chris favored his right leg and was walking with a slight limp. The gambler grimaced as Chris stopped mid-stride, stood stock still for a moment, before continuing to the rear of the stage where the luggage was housed. “Go get the tickets. I’ve got the bags,” Chris snapped as he scooped up their bags. Chris grunted in acknowledgement as the gambler ambled down to the ticket window. Chris Larabee stared out the window as the sun set leisurely in the distance. The reds and pinks coloring the sky gradually changed to the cool blues of twilight as Chris listened with half an ear to the low murmurings of his fellow passengers as they settled in for the long trip to Denver and beyond. Scowling at Ezra for the span of a moment Chris turned back to the window in frustration. He’d been saving as much as he could to buy more material for his cabin and now he’d have to pay for the first class ticket. If he’d been the one buying the tickets they would have ridden in the cheaper seats. It was only fifteen hours to Denver. Contemplating his choices for a moment Chris quipped, “I’ll stay here.” He enjoyed the calm atmosphere in the first class car and could imagine how excited Rupert would be with everything going on around him. The boy would probably be up half the night as any child would. “I actually find sleeping on a train to be comforting. The gentle rocking and the clacking of the wheels along the track can be quite hypnotic.” Ezra turned his attention back to the paper effectively ending the conversation. Staring out the window Chris watched as their next stop came into view and his stomach growled in anticipation of the meal they would be wolfing down while the train refueled. He hoped there was a saloon nearby so he could have a drink and a smoke before they had to continue on to Denver. “Were you planning on having supper this evening? I suggest we depart so that we may get a decent seat. Unless of course you don’t mind eating what’s left from the last stage stop. I for one am ready for a hot meal.” Rising from his seat Ezra waited for an answer. The first dining establishment they passed was full with a line of patrons waiting on the front porch and the second appeared to be no less crowded. Standing on the edge of the street Chris glanced first up one way and then down the other. There had to be somewhere else nearby, maybe even a nice saloon. Scowling darkly as he tuned out Ezra’s complaints, hopping off the boardwalk he followed the tinkling notes of an out of tune piano that floated on the evening air. It wasn’t long before they were turning down a dark and seedy alley to stop before a saloon which had seen better days. Looking up at the weathered building with trepidation Ezra sighed. “Excuse me, Mr. Larabee. Do you think it’s prudent to visit this establishment?” Raucous laughter and feminine squeals poured out into the alley along with the heady aroma of stale cigars and alcohol as he peered through the batwing doors into the dimly lit, smoky interior. Wrinkling his nose in distaste Ezra stepped back hoping Chris would re-evaluate the situation. Pushing through the doors without a backward glance Chris entered the bar. Heaving a heavy sigh Ezra reluctantly followed the black clad gunslinger inside. “I’ll take it.” Chris smiled as the barmaid fussed with her bodice. “I thought you said we weren’t going to miss the train,” Ezra shouted as they ran up the street putting on more speed as the train’s whistle blew. Scowling as the distance between he and Chris grew, damn the man’s long legs, he lengthened his stride. “It’s early.” Chris huffed back as he turned the corner heading toward the train platform. Gaining the platform a few moments later Chris stopped to rub at a stitch in his side while waiting for Ezra to catch up. Chris groaned as his overfull stomach voiced its displeasure over the hell bent for leather run from the saloon to the train platform by flip flopping several times. “Are you okay?” Ezra wheezed out as he pulled himself up onto the platform. 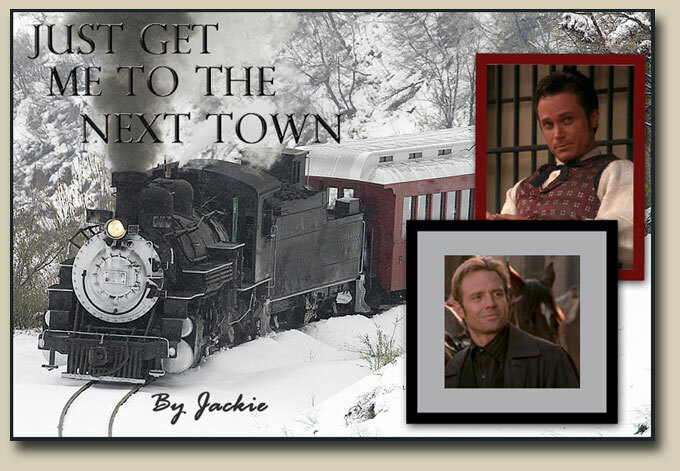 Chris just nodded and moved toward the train as it started pulling out of the station. He was just about to pull himself onto the train when the sound of a child yelling had him spinning around. Squinting in the low light he could see Rupert Brooks running up from the far end of the platform yelling for his mother. Hearing Rupert’s calls Ezra groaned as he realized waiting for the child would cause all of them to miss the train. “Go! Get on the train. I’ll catch up.” Chris called to him as he ran toward Rupert. Shaking his head in amazement Ezra turned and ran to hop on the train knowing that Chris would need his help to get the wayward boy on board. Pulling himself inside he almost bowled into Mrs. Brooks who was near the entrance screaming for her son. Turning back to the bottom stair Ezra leaned out hoping Chris hadn’t fallen too far behind. To their advantage the train had not yet picked up too much speed and Chris was catching up with Rupert tucked neatly by his side. Securing himself as best he could Ezra reached out to grasp the boy’s out raised hand. With Rupert safely inside he moved away so Chris could swing himself up onto the train. Once on the train Chris dropped onto the nearest seat to concentrate on breathing. The ringing in his ears almost drowned out the people cheering and laughing as Rupert sang his praises. Without a word Chris levered himself up and followed Ezra to the end of the car, before he could step out a small hand grabbed his. Looking down he saw Rupert smiling up at him. Smiling back at Chris he waved goodbye and ran back to his seat. Chuckling to himself Chris stood and exited the train car and made his way back to his seat. Ezra bit his lip before raising a tentative hand and tapping on the water closet door before him. “Um. Mr. Larabee are you quite all right?” Waiting for a few moments and when no answer was forthcoming, knocked again. “Chris, do you need assistance?” Grimacing when his only answer was the sound of Chris being violently ill.
“Go away,” Chris groaned as he dropped to the floor wrapping his arms around his abused midsection. There can’t be anything left. On the last bout of sickness he’d expected to see his boots come up. Should have eaten what was left over from the stage. Against his better judgment he’d opted for the gravy laden fried chicken dinner with mashed potatoes and now here he was curled up on the floor praying for relief as the swaying of the train again forced bile back up his throat. He cursed roundly in agony as he was forced to abuse his stomach muscles yet again. He should have waved the dinner off when he’d noticed how greasy the chicken had been. The sound of the water closet door being yanked open almost had him turning around. The knowledge that it could only be Ezra kept him focused on his current objective of keeping his stomach inside his body. “Sorry, Chris. That’s not going to happen. Besides it’s only six hours until we reach our destination and there’s nothing but snow and ice around us. “Snow? That’s why you’re freezing.” He hadn’t considered the temperature outside had changed. Steeling himself as he moved to his knees he waited for his stomach to clench. When nothing happened he let Ezra’s assist him to his feet and he staggered from the water closet. The trip back to their train car seemed to take forever and by the time they were stopping by their sleeping berths Chris was sweating profusely and shaking like a leaf in high wind. Reaching forward Ezra pulled the blankets back so Chris could lie down on his sleeping berth. Looking around he noticed that all the other curtains were still pulled shut but he’d bet his gold tooth that they had an audience. In the semi-darkness of the car Ezra whispered, “Your welcome.” Removing his own boots Ezra levered himself up onto the overhead bunk. He really would have preferred the lower bunk but if Chris happened to get ill again in the night he didn’t relish the possible outcome. Turning onto his back he pulled his blankets to his chin, listening to the sounds of the train clacking along the tracks. He yawned as the swaying of the train lulled him to sleep.